Lewandowski: "There's nothing new with Robert," says Kovac. NIKO KOVAC IS adamant Robert Lewandowski will not leave Bayern Munich despite the Polish striker’s open interest in a new challenge. 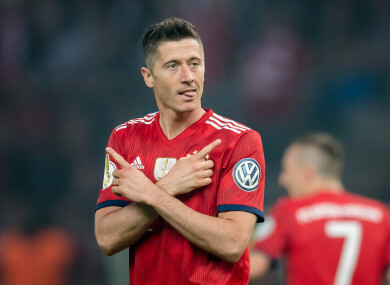 Lewandowski’s agent Pini Zahavi has previously confirmed his client’s hope to move on from the Allianz Arena and Kovac is aware of the desire. Manchester United and European champions Real Madrid have long been linked with Lewandowski, while Borussia Dortmund CEO Hans-Joachim Watzke added further fuel by revealing he would be willing to spend €100 million to bring Lewandowski back to his former club. Kovac, though, is not prepared to lose his star striker. “There’s nothing new with Robert. It’s clear that he will not leave this club because we have a top striker and we certainly do not want to relinquish him or give him away,” Kovac told Sky Sport Germany. Though he acknowledged Lewandowski’s interest in leaving, Kovac described the 29-year-old as a “full professional” that would not attempt to force a move. “It’s true that Robert toys with going elsewhere. Only [he has] one thing he likes, the other is what we like to do,” the former Eintracht Frankfurt coach said. Bayern play United in their final pre-season friendly before squaring off against DFB Pokal winners, and Kovac’s former club, Eintracht Frankfurt in the German Super Cup. Email “Bayern boss says Man United target Robert Lewandowski is going nowhere”. Feedback on “Bayern boss says Man United target Robert Lewandowski is going nowhere”.